At 5:30 a.m. I pulled the anchor in pre-dawn darkness. The darkness didn't really matter, though, since dense fog limited visibility to just a few boat lengths. Running in these kind of conditions is both fun and challenging. The chartplotter (actually two or three, running different scales, different cartography, and from different GPS sources) shows where I am relative to land and shallow areas. AIS shows where the big guys are, and more and more small boats are visible on AIS, too. The radar shows everything: land, boats, buoys, big logs even, but it requires the most skill to interpret. 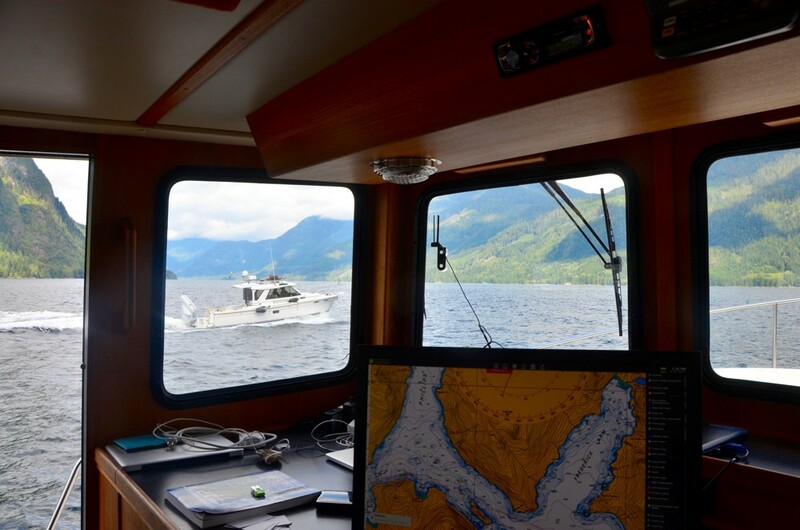 And the autopilot steers the boat, freeing me up to interpret all the navigation data in front of me. No matter what the conditions are like—yes, even when it's sunny with unlimited visibility—I use all the navigation tools as if I were in darkness or fog. That way, when I need the tools, I remember how to use them. Yesterday and this morning were good tests. Thankfully, no collisions or close calls. Why leave so early? We were hoping to meet up with friends in Waiatt Bay, which meant we needed to transit tidal rapids in Okisollo Channel near slack. Slack was at about 1:15 in the afternoon, and we needed to cover 50+ nautical miles. 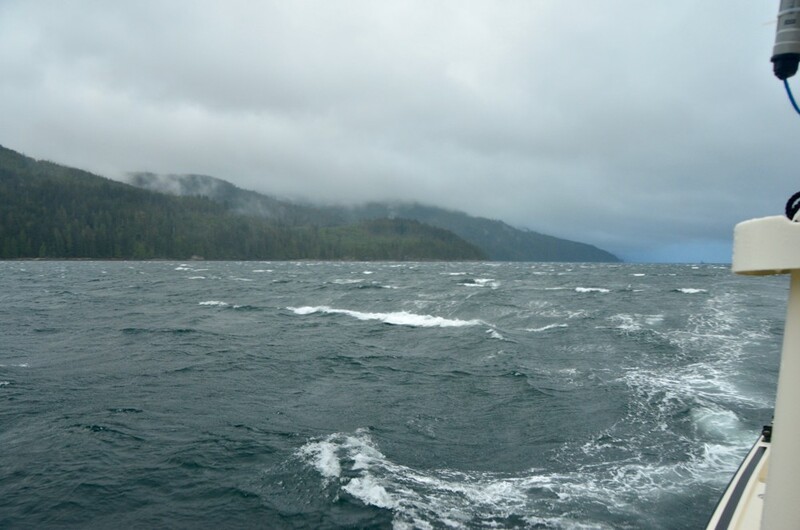 Johnstone Strait didn't cooperate. The wind was blowing from the northwest (behind us, at least) at 25 knots, gusting to 35. The current was ebbing, slowing our progress and steepening the waves. The ride wasn't that bad, but it wasn't great either. We ducked out early, cheated Whirlpool Rapids and Green Point Rapids (both have a basically laminar (smooth) flow), and headed for Shoal Bay. Getting closer to civilization...this guy passed super close. Shoal Bay is a great stop. 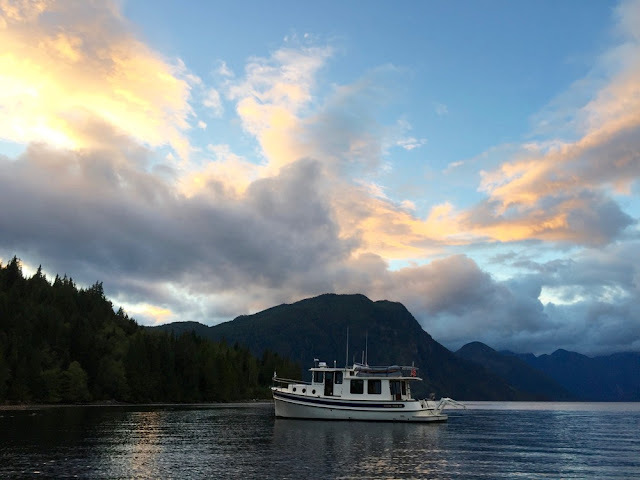 The anchorage is only marginal—rocky, steep to, and subject to boat wakes—but we got the anchor set and headed ashore. Side note: for those not inclined to anchor, there's a public dock, rafting mandatory, first-come, first-served. Why is Shoal Bay such a great stop? There's a great hike up to a lookout. Walking at a reasonably brisk pace, the hike took us 40 minutes. The view down on Shoal Bay and up Phillips Arm is breathtaking. There's also a pub, which is really a cabin with a killer view. They have a single beer on tap, a few bottled/canned beers to choose from, and your choice of red or white wine. It's relaxed, unpretentious, and authentic...the perfect place to hang out after a hike. The Shoal Bay pub also makes a mean Ceasar! !